After a short sojourn to the bar for a pint of Shipyard and a medium rose, it was time to get settled, have a chinwag with my fellow bloggers and get ready for some inspired cuisine. Good thing come to those who wait! See I told you! Worth the wait, wasnt it! I’m also happy to report that (as you may have noticed from the menu), they’ll soon be coming to Deliveroo too! First the Swine fries. Sitting under the mound of jalapeno’s, slaw and slow cooked pulled pork sat a good sized portion of hot crispy fries, the pulled pork was done well and went well with the pickled cabbage. Second was the beauty of the marinara fries. The marinara sauce was rich tomatoey goodness, with some good hearty chorizo in the mix. Third (though you can’t see them hidden under the coriander) were goat cheese and pepper stuffed meatballs also in a marinara sauce, served with a garlic and coriander flatbread. This was Wifey’s highlight of the first three starters and she would have happily sat there with flatbread and marinara sauce! The above three dishes are also available to have as a main (no, really that’s the side size above). There was also a generous portion of hot, sweet, crispy and delectable sweet potato fries. They’re some of the best I’ve tried and did not fall foul of the ‘sogginess’ that some sweet potato fries have. With that it was tuck-in time! However, we had no time to rest as shortly after the sides had been demolished, it was time to get onto the burgers. First the corporate sellout: two beef patties with shredded lettuce, grilled onions, dill pickles and secret sauce in a butter milk bun. Mmhmmm, this is a tasty burger! The beef patty was just right for me and Wifey, which is a rare breed! I’m a medium rare fan and she blasphemes with “well done”! This had just a touch of pinkness which satisfied me and didn’t send Wifey running to the hills. Next the falafel stack. Eschewing the buttermilk bun, instead three spicy but not young blistering falafels were partnered with lettuce and radicchio and an amazing cucumber and cumin raita. If I was a veggie, I’d be more than happy to stack this up against it’s meaty brethren! And the final one of the trio was the bayou burger. Buttermilk fried chicken tossed in buffalo sauce with a slice on “‘murican” cheese and coriander slaw. Wifey enjoyed it being a proper piece of chicken instead of reformed meat. For me, it was slightly too sweet with the combination of combination of buttermilk batter and buttermilk bun, A nice floury bap would have pushed it over the edge from a good burger towards greatness for me. Whilst we scoffed burgers, the pizza’s popped up so we grabbed a ‘pizza the action’! First the pizza’s was the Ciao Bella, a honey and wholegrain base topped with mediterranean vegetables, olive tapenade and mozzarella finished with a balsamic glaze. I managed to scarf down a slice and it was a nice sweet pizza full of flavour. And the second pizza was a delightful twist on the ubiquitous Hawaiian. With Parma ham and Sailor Jerry infused pineapple teamed with sourdough and buffalo mozzarella, it didn’t last long enough for me to get a proper photo! To go with the pizzas came a beautiful Couscous and Bulgar Wheat salad, partnered with pomegranate seeds roasted peppers and beetroot shoots, drizzled in a lemon and tarragon dressing. It was very nice with a sweet and sour balance. With that, we thought we were done, my belly certainly did. However, in best infomercial style, there was more (from the sides list)! This was my highlight of the evening. Beautiful, crisp, crayfish which melted on the tongue and which went perfectly with the warm heat of the wasabi mayo. Well I say wings, more like half a chicken. these wings could have came off a goose. The batter was not overloaded, and so good. We had blue cheese and their secret hot sauce. There are no words: all I can say is go and get a kilo of them and meditate in food heaven for a while. With that, it was time to finish off with a cocktail and try and move myself back home. It won’t be long before Wifey and I are back again. My thanks to Vicky and the team at the Victoria and Danny, the head chef for keeping us well fed. I’m sure the crowd coming through the new New Street Station will be chomping at the bit to get through the door. 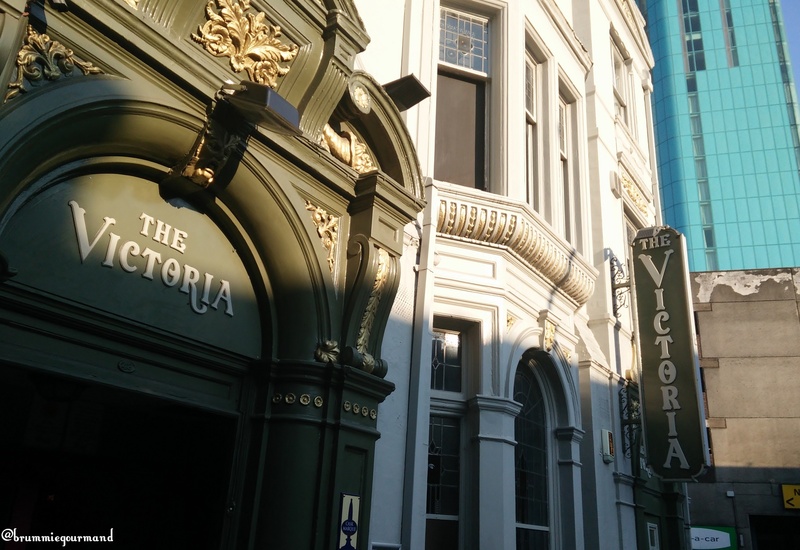 I’m happy to report the new menu seems to have given The Victoria a foodie soul again. Disclaimer: For this evening, we were guests of Bitters’n’Twisted and The Victoria who provided all food and some of our drinks; this provides no bias to the review. This blog is my own personal opinion and strives to provide an independent view, promoting, enjoying and reviewing the range of exciting food and venues in and around Birmingham.